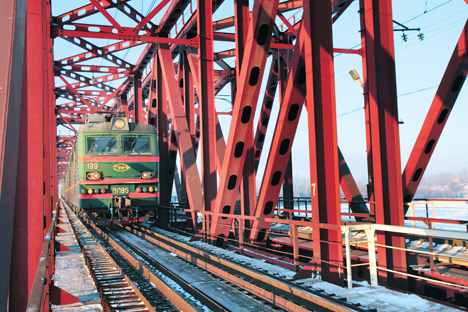 Moscow offers APEC members the Trans-Siberian Railway as a replacement for the Suez Canal. At a meeting of APEC transport ministers in St. Petersburg on Aug. 3, Russian Transportation Minister Maxim Sokolov made an ambitious proposal: Moscow suggests redirecting about 10 percent of transit traffic between APEC and the European Union across its territory, offering an alternative to the Suez Canal and lower transport costs. Russia had declared improving logistics as one of the four key priorities of its 2012 APEC chairmanship, and as he opened the meeting, Sokolov enumerated the initiatives that Russia had put forward during the last 12 months. These include the installation of GLONASS-based satellite tracking systems at major transport hubs, coordinated response to emergencies and elaboration of unified early warning standards, counter-terrorism management of transport infrastructure and harmonization of customs procedures within APEC. But, Sokolov said, Russia’s main proposal is to diversify the routes for transporting goods from the Asia-Pacific Region to Europe. The highlight of Sokolov’s presentation was a slide showing goods from Asia flowing to Europe not via the Suez Canal, but via Russia, using the upgraded Trans-Siberian Railway, the Baikal-Amur Mainline and Russia’s Pacific seaports. “A diversification of traffic flows can offer substantial economic benefits by reducing transport and transaction costs, which will mean lower product costs for final consumers,” Sokolov told his counterparts. In Sokolov’s words, Moscow would like Russia to account for about 10 percent of commodity flows from Asia to Europe in the near future. Korean Deputy Minister of Land, Transport and Maritime Affairs Joo Sung-Ho called development of alternative routes via Russia a priority for the entire region. At dinner, the officials discussed the future of these far-reaching plans with business leaders, who supported the initiative but mentioned the problems that needed to be addressed. Russian Railways Vice President Alexander Saltanov spoke about multi-billion investments that his company will require in order to promote direct traffic of goods to Europe, including a project to build a railway from South Korea through North Korea with a connection to the Trans-Siberian Railway and the construction of a Russian-gauge railway extension to Vienna. Ziyavudin Magomedov, chairman of the board of the Summa Group and this year’s head of the APEC Business Advisory Council, agreed that new transport infrastructure needs to be built, but believes it is important to make sure that the available facilities are fully used. In Magomedov’s opinion, at the top of the agenda should be improving dispatching, customs procedures and sophisticated technologies. “A container takes an average of 28 days to make its way from Vladivostok to Moscow – of these, it runs for 10 days, while customs clearance takes 13 days. In Singapore, a container takes up to 24 hours to be cleared,” Magomedov said. Ivan Nechayev, head of Russian Navigation Technologies, suggested that the APEC economies should adopt a single standard for recording information about a container on an RFID chip to be read subsequently by a special scanner. He believes that if chips replace customs documents, freight will be handled four to six times faster. Other participants in the meeting asked if part of the problem was state-run Russian Railway’s monopoly on the market and whether Russia should consider privatizing the operator to increase its efficiency. “Privatization does not necessarily make a business more efficient. We should be very cautious here. There are very successful state companies, such as Deutsche Bahn,” said Saltanov in response.